MONSTER SUP is the latest craze to hit Hawaii, and SUP DUDE is proud to be blazing a trail as the Irish Pioneers of this new phenomenon. MONSTER SUP is like a giant inflatable raft. 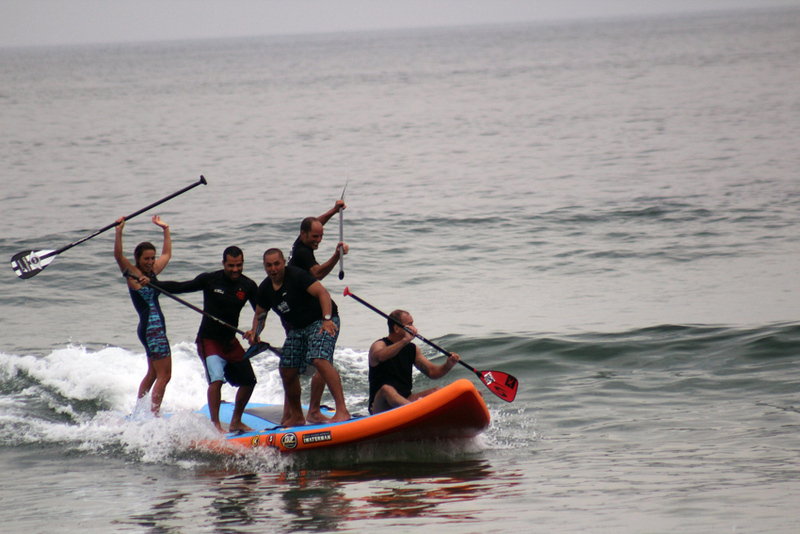 It can hold 8 people, all you have got to do is stand up and paddle. Whether you’re a first timer or an accomplished waterman, everybody turns into little kids when they get on the MONSTER SUP… It is so much fun!!! And even if you wipe out, the 16-foot-long, vinyl raft makes for a soft landing. Grab a group of your friends and get ready for some huge fun! Party paddle this monster inflatable stand-up paddleboard! Put together a team and ride the surf or cruise our beautiful awe inspiring coastline. There is even room for a picnic on the water! Great for family gatherings, wedding parties, hens, stags or just plain super memorable fun with friends! Come party paddle with us! SUPSquatch Surf… Hold on if you can! !